I also have a bucket of protein powder that I have left over from a protein phase of my life, long since passed. I tried his recipe, and when I interpreted it (let’s face it, does anyone really follow recipes verbatim?) and substituted a few ingredients, it taste ok, but was like eating tires. This is not his fault – he let me try his rendition, and it was like eating pureed manna. pour half a cup into hot butter on a small pan. So why almost perfect? 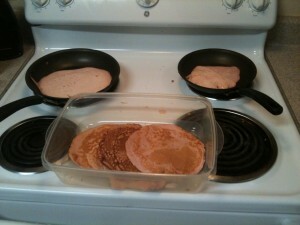 Well, my protein powder is strawberry which turns the mancakes pink. Not very macho. Previous post: Why is backspacing so slow?